Herbarium specimens (pressed plants mounted to paper) are beautiful works of art, but also serve importantly to document the natural world, to aid in plant identification, to further our understanding of plants and plant diversity and to facilitate new discoveries in botany. In my mind, and quite likely for many others, botanical specimens are where science, history, and art intersect. As I sort through specimens of Marcus E. Jones, truly exquisite collections of both botanical and historic significance, I am reminded of this important connection among disciplines. Marcus E. Jones (1852–1934) was one of the most prominent botanists of the American West. Jones collected thousands of plants, and photographed and recorded detailed notes of the regions he traveled in. Jones’ plant collecting at the turn of the century provided an early comprehensive characterization of the flora of the West; he collected in areas that were poorly known, some of which have since been developed. Jones was also a skilled plant taxonomist who described hundreds of new species, many of which are represented as type specimens (a specimen selected to serve as a reference point when a plant specimen is first named) and are housed in our herbarium at Rancho Santa Ana Botanic Garden (RSABG). In 1882, outlaw Jesse James was killed by Robert Ford, Thomas Edison created the first string of Christmas tree lights, Robert Koch discovered the germ that causes tuberculosis, and Arizona, Colorado, Utah, New Mexico, Montana, and Idaho, among others, had yet to achieve statehood. 1882 is also the year that Marcus E. Jones took the first of several botanical trips to Baja California, Mexico. The plant collections and archives from Jones’ trips to Mexico (one in 1882, a second in 1892, and four trips during 1926–1930) are the focus of an ongoing project in the herbarium and library at RSABG: to research and digitize the most important portions of the Jones specimens and archival collections. The herbarium houses an estimated 100,000 specimens collected by M. E. Jones (originally purchased by Pomona College in 1923 and later transferred to RSABG), representing plants from western United States, California, and Baja California, Mexico. In addition to the plant collections, the library houses the M. E. Jones archives, which contain his photographs, field notes, diaries, manuscripts, and correspondence with other important botanists, including Alice Eastwood, Katherine Brandegee, and Philip A. Munz, among others. Digitizing Jones’ specimens involves a series of steps: specimens are located and pulled from the main collection in the herbarium; each specimen is barcoded and databased (in which information on the collection label is recorded in our herbarium database); the specimen is then imaged using an inverted scanner (to prevent from having to turn a specimen over). It takes approximately four minutes to produce a high-resolution image of the specimen. 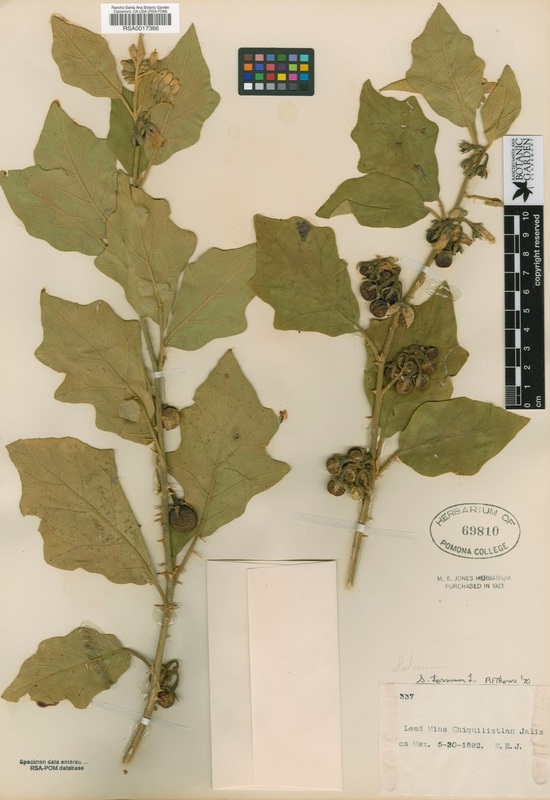 To date, we have databased and imaged more than 1000 specimens in the herbarium. 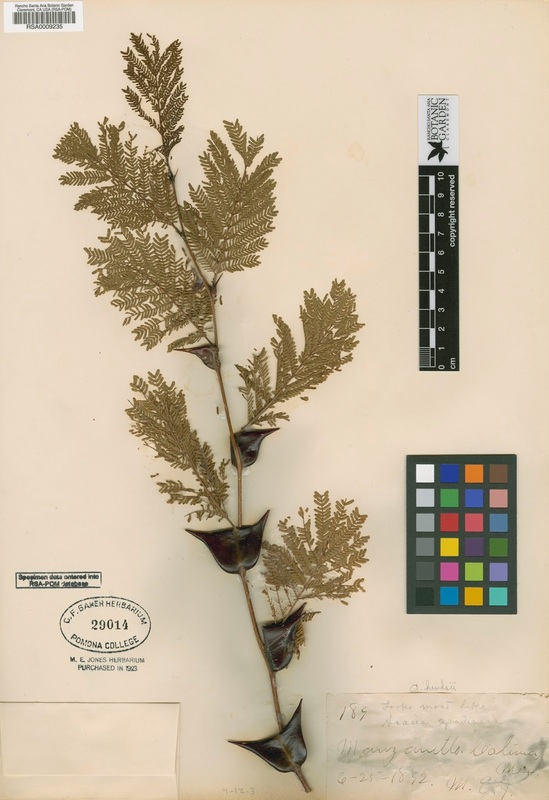 The images and data associated with these specimens (metadata) are now available through the Global Plants Initiative through JSTOR, a shared digital online library (http://plants.jstor.org). In the library, preservation of the Jones collection involves cleaning, labeling, and accessioning the contents of the Jones archives. Glass slides, negatives, and photographs are stored in protective sleeves, and the pages of photo albums are protected with sheets of archival tissue sandwiched between. Each item is accessioned and organized in archival quality boxes. Descriptions and metadata of all archived items are captured in an electronic database. In addition, we have imaged archived objects (such as glass slides and negatives, photographic prints, correspondences, diaries, and notebooks) using similar methods for herbarium specimen imaging. Many of our herbarium staff, graduate students, and volunteers at the Garden have been involved in various aspects of the Marcus E. Jones project. 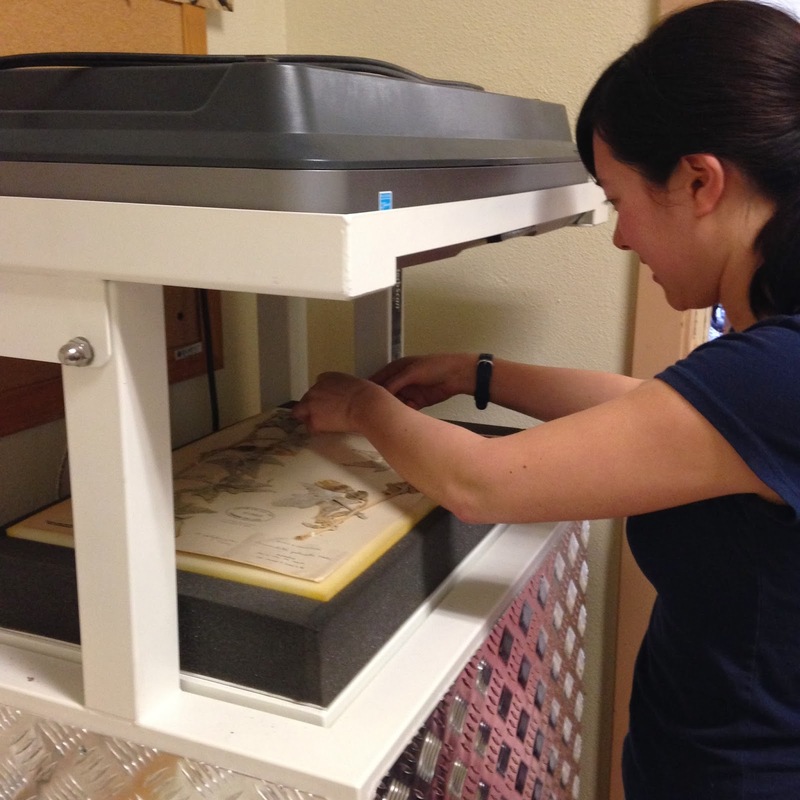 Curatorial Assistant Jessica Chairez has largely led the charge, overseeing nearly all aspects of the project, including data entry, imaging specimens, compiling metadata, processing the archives collection, and training students and volunteers. Graduate students Diana Jolles, Forrest Freund, and Manuel Lujan have participated in pulling specimens, databasing, and imaging. Volunteer Robert Swank has assisted with archiving the photographs and photo books. 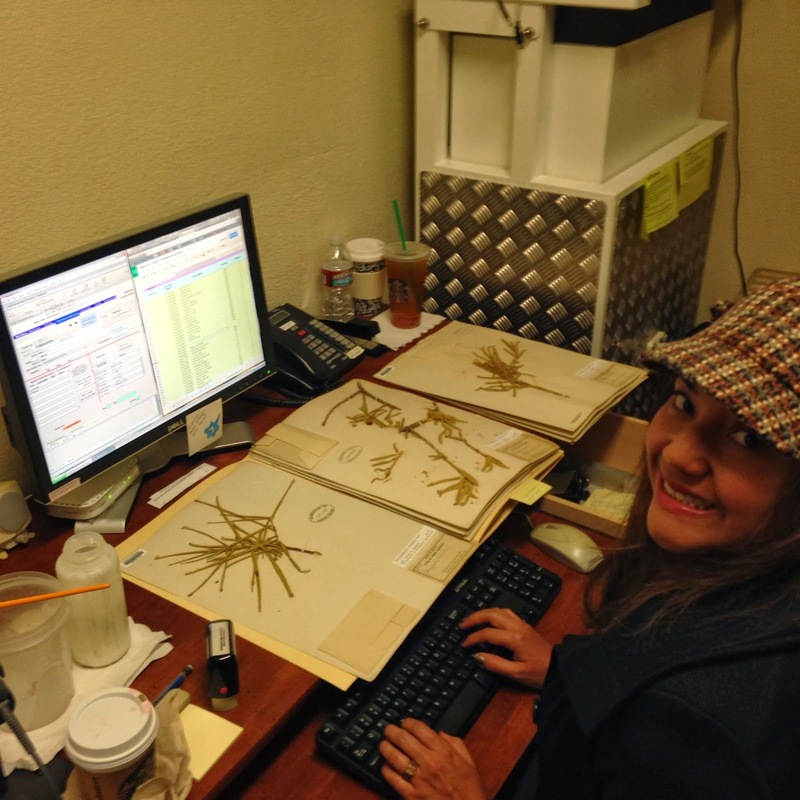 A new addition to the project, volunteer Marilyn Irwin, has recently been trained to image herbarium specimens. The dedicated efforts of staff, students, and volunteers helped to make digitizing the first thousand specimens of Marcus E. Jones collections possible. And we are already well underway of digitizing our second thousand! Lenz, L. W. 1986. Marcus E. Jones: Western Geologist, Mining Engineer and Botanist. Rancho Santa Ana Botanic Garden, Claremont, CA. Rush, E. 2007. Marcus Jones: an outspoken maverick (1852–1934). Fremontia 35: 9–13.